* Sixty eight percent of the subjects felt that the Mediflow waterpillow was better than the pillow they normally used. * Sixty eight percent of the subjects felt that their sleep, when using the Mediflow Waterpillow, was actually better than usual. * 90% of the subjects said they would continue to use the Mediflow Waterpillow. * Most (84%) of these subjects expressed that they liked the Mediflow Waterpillow, in that they rated the pillow an 8, on a 10 point scale. MARKHAM, Ontario, Feb. 6, 1997 -- A peer-reviewed independent, published clinical study on the therapeutic effectiveness of cervical pillows released by Johns Hopkins University School of Medicine in Baltimore, Maryland, revealed that the Mediflow Waterpillow from is a simple and effective way to reduce neck pain and associated headaches. The study also found that users of the U.S.-manufactured Mediflow waterbase pillow experienced an improved quality of sleep which in turn creates a better quality of life. 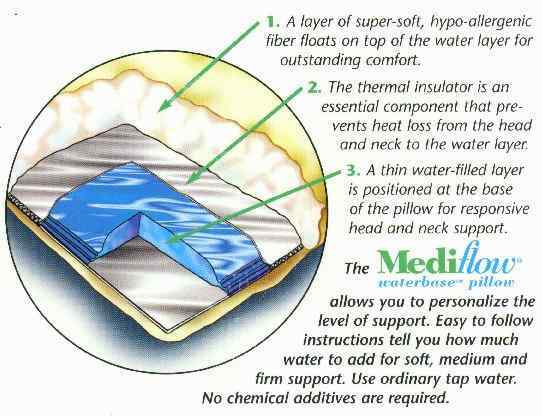 The Mediflow waterbase pillow's specific engineering and patented design places the water-filled pouch at the base of the pillow . The Mediflow waterbase pillow, a new and totally unique bed pillow, is currently the only cervical pillow on the market with independent, peer- reviewed, published clinical proof of efficacy. Every person's anatomy is slightly different. People have different preferences about the firmness of their pillow. On average, there are 12 major body shifts and 50 movements in head and neck position during sleep. As you roll from back to side, the water instantly adjusts to maintain correct head and neck support and outstanding comfort. Instantly Adjusts To Any Sleeping Position. You can change the firmness by the amount of water added, just like a waterbed. Supports the Cervical spine ideally. The water pillow is surrounded by an Extra Soft Layer of Polyester fill to make it perhaps the most comfortable pillow ever.